Lutz Huelle took out his scissors again and this season tackled the coats, jean jackets and military-style bombers. “I thought, I’m going to cut into patterns and see how they fall — just open them,” he explained, backstage after the show. He made it sound simple, but that’s the sign of a pro. Adding panels of fabric, including shearling, a Lurex jacquard and a strange quilted metallic material, he rearranged the hemlines, and much of the rest, as well. Classic pieces including an elegant herringbone coat and a white cotton blouse were transformed, too, by extra-wide sleeves with voluminous puffs on the shoulders. This latest installment of his ongoing endeavor to transfer couture codes to streetwear struck the right tone. He’s not the only one chasing this ambition, but is clearly one of the more successful. 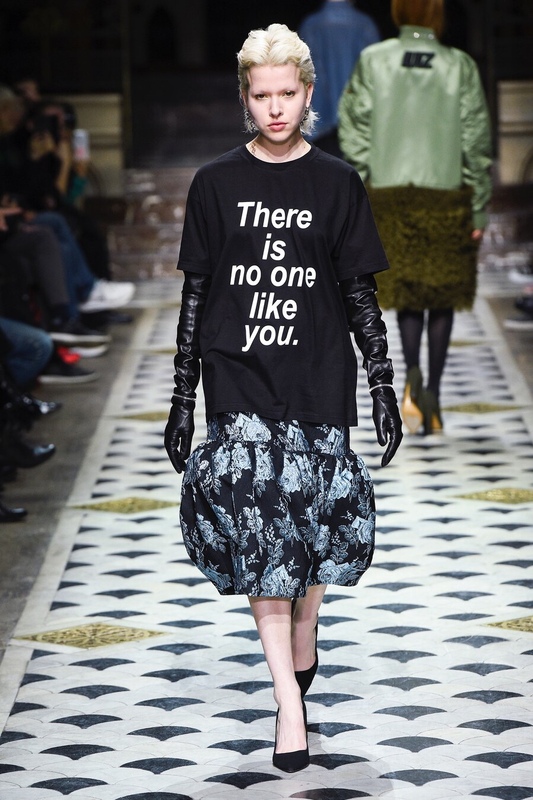 The last model in the lineup carried a message on her plain black T-shirt: “There is no one like you.” Closing the show, the models skipped down the runway in a crowd, dancing to a pop number by Cher and relaying another Huelle message — positive vibes. Previous LUTZ HUELLE F/W 18 ´ How to change the silhouette of a garment without losing its original sense or use —a cinched waist in a denim jacket, a draped back in a cotton shirt, an elongated asymmetric hemline in a zipped jacket. I added panels of wool, lurex jaquard or metallic wadding at different points, pushing the volume to the front or back or simply changing the fall of a hemline. Last season’s rounded jackets have turned into shirts; and on skirts the volume has slid down just under the knee. Worn with a cinched waist bomber, they continue the idea of couture in a day- or sportswear context. The oversleeves are pushed even closer to the neckline, adding drama and poise to wardrobe staples like a woolen coat, a cotton popeline shirt or a tuxedo jacket. In the end, I wanted a collection with a sense of strength, positivity, and ease going into the future.